10% Acetyl Hexapeptide-8 which reduces muscle contraction. Minimizes long term formation of lines and wrinkles. Contains MSM or Methylsulfonylmehthane which enables nutrients to be absorbed deeper into the skin. Contains Alpha Lipoic Acid, DMAE, vitamins A, E, and C Ester, and no artificial colors or fragrances have been added. It wears well under make-up, and further protects the skin from free radical damage caused by pollution and sunlight. 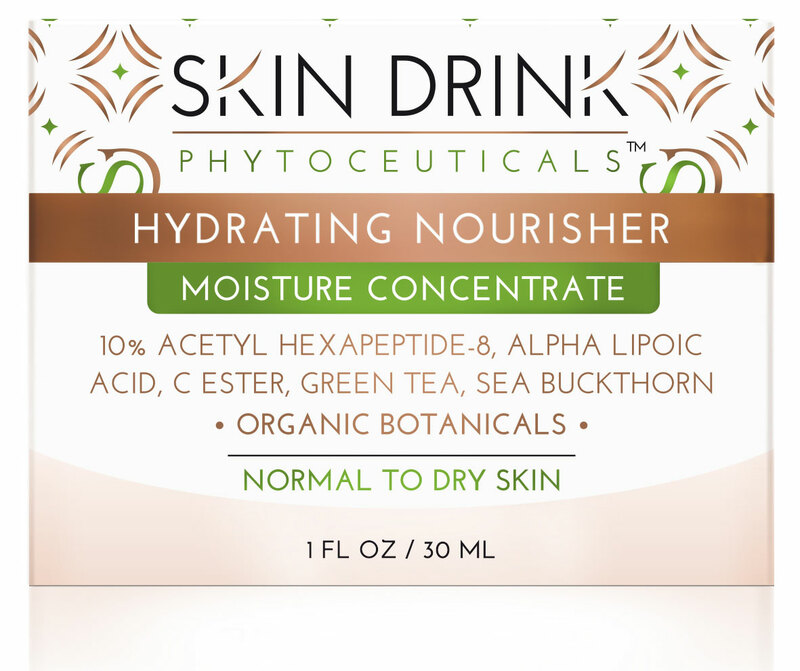 The Hydrating Nourisher has 10% Acetyl Hexapeptide-8 which reduces muscle contraction, helping to minimize long term formation of lines and wrinkles. It disrupts the nerve signals sent to tense muscle beneath the dermis, functionally relaxing them and smoothing the overlying skin. When this is added to the other natural ingredients, results are unbelievable! 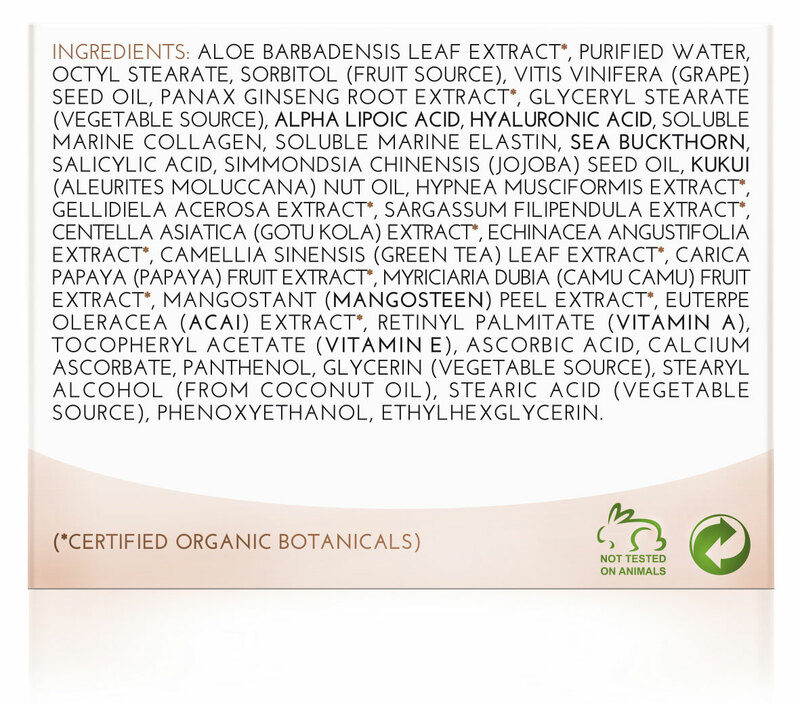 All together these ingredients combine to create an exceptional product that deeply moisturizes, nourishes, and firms. It can be used both day and night. 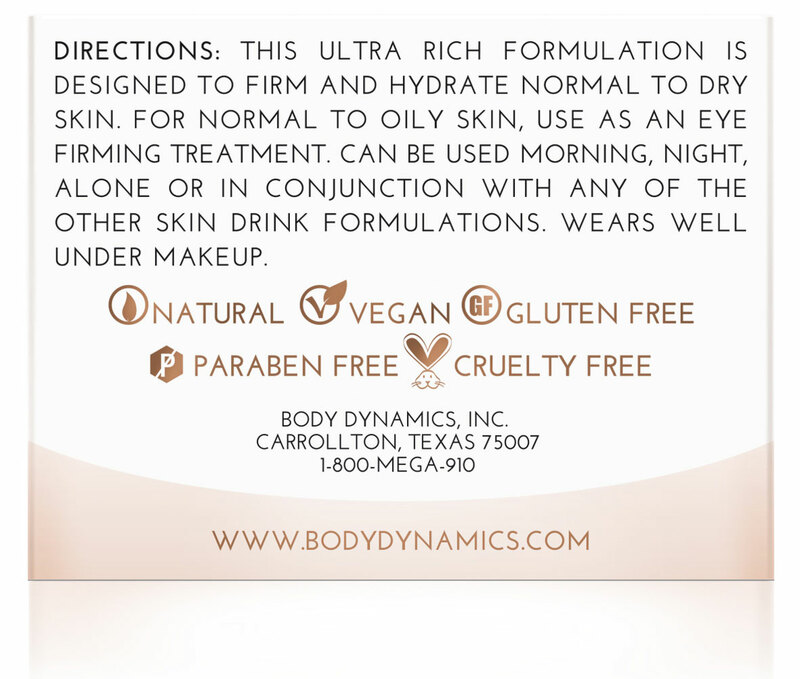 Normal to dry skin can use it alone or in conjunction with any of the other treatments. It provides firming and nourishing for the face and throat. It wears well under make-up, and further protects the skin from free radical damage caused by pollution and sunlight. Like the other formulas in the Intensive Renewal line it is Aloe based, contains Alpha Lipoic Acid, DMAE, vitamins A, E, and C Ester, and no artificial colors or fragrances have been added. This formula contains MSM or Methylsulfonylmehthane. This enables the nutrients and botanical extracts to be absorbed deeper into the skins inner layers plumping out lines and wrinkles. Studies have shown a significant increase in moisture content in the deepest layers of the skin when MSM is included. 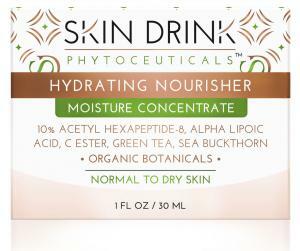 The Skin Drink Hydrating Nourisher also contains Panthenol (vitamin B5), Grapeseed oil, Jojoba oil, Kukui nut extract, Algae extract, Elastin, Collagen, Ginseng, Gotu Kola, Echinacea, Green Tea, and Papaya extracts to provide naturally occurring antioxidants, Polyphenols, bioflavenoids, and nutrients A, C, and E. They also aid circulation, and provide anti-viral properties. In addition, these botanical extracts contain vitamin K and many minerals. The Papaya extracts further enhances the sloughing off of dead skin cells revealing a younger fresher skin. The formula is Aloe Vera based, and contains DMAE, Alpha Lipoic Acid, and C Ester. These ingredients along with the nutrient rich herbal extracts and botanical oils penetrate to the deepest levels of the skin to rebuild and nourish new skin cells. These include Sea Buckthorn oil, Squalane, Safflower oil, Carrageenan, Comfrey, Cucumber, Ivy, Lemon, Sage, and Allantoin, These natural ingredients all add up to the most comprehensive natural skin care available.